Dry rot is a term people use to describe the visible signs of a decaying tire. The most visible symptoms of tire dry rot are cracks in the side wall and discoloration. A severely dry rotted tire will fade from black to gray and exhibit deep cracks throughout the sidewall. Although these are symptoms of an aged tire, deterioration can appear even before a tire has reached its expiration date and they are not always obvious. Tiny cracks can appear on the outer edge of the tire tread when the majority of the tread is still intact and the side wall looks normal. 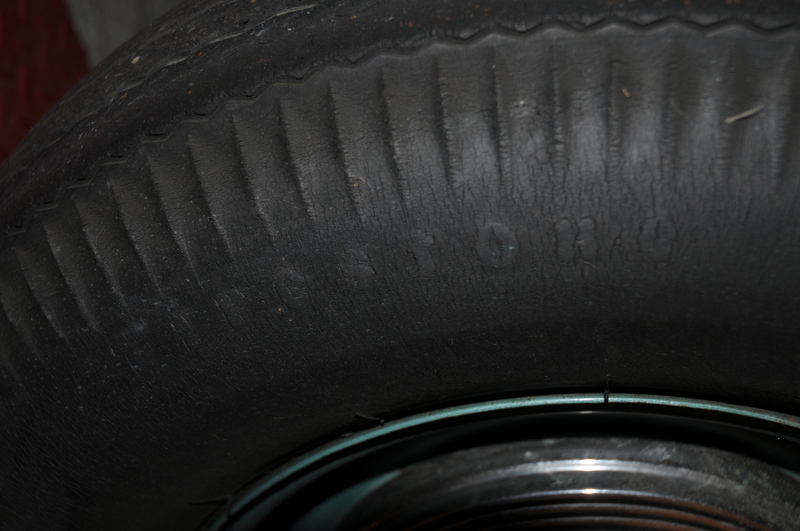 Since a mildly dry rotted tire is not as easy to spot, tires should be routinely inspected. A tire that displays any sign of dry rot is less structurally stable to drive on and should be immediately inspected by a tire care professional. What causes a tire to dry rot? There are several factors that cause a tire to become dry rotted. The environment the tire is exposed to, the age of the tire and the frequency of use will all contribute to this condition. Although the rate at which a tire becomes dry rotted can be slowed, eventually over time all tires will expire. The environment in which a tire lives in is mostly responsible for dry rot damage. When a tire leaves the manufacturing plant it is immediately exposed to three unavoidable components of our environment: ozone, UV light and oxygen. These three components immediately begin breaking down the rubber molecules the tire is comprised of. This is deterioration is caused by two chemical reactions known as crosslinking and chain scission. Cross linking increases the density of the rubber, causes color fading and reduces the strength, flexibility and over all durability of the tire. (7) Chain scission results in a loss of elasticity in the rubber. (10) The combination of the two chemical reactions produce cracked, frail, faded rubber. The sun exposes your tires to a form of radiation called UV light. Both natural and synthetic polymers absorb UV light produced by the sun. Since tires are made up of a rubber compound, which is a mixture of polymers, mainly natural rubber and synthetic rubber, photo degradation immediately takes place when tires are exposed to the sun. Oxygen has been noted in Introduction to Rubber Technology (1959) to be the most destructive rubber degrading element of our environment. Unlike UV light, oxygen attacks a tire from the inside and the outside. The majority of cars on the road utilize compressed air, which is composed of approximately 21% oxygen, to maintain factory recommended tire pressure. 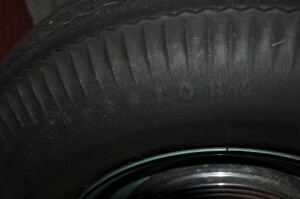 The oxygen level of the compressed air degrades a tire from the inside, while the same destructive process is occurring on the outside of the tire. No matter how much care is taken to reduce a tires exposure to UV light, oxygen and ozone, tire age will always come into play. Protectants mixed with the tires rubber compound designed to shield the rubber from UV oxygen and ozone do not provide indefinite protection because they are consumed by these elements as the tire ages. Another uncontrollable result of tire age is inner liner thickness. The thickness of the inner liner will decrease with age from constant exposer to oxygen and heat. As the thickness of the liner decreases, oxygen increasingly passes through the liner, seeping into the rubber of the tire exposing it to even more oxygen. The rubber compound that makes up a tire contains a protective wax that is intended to protect the tire from oxidation. The protective wax provides protection when it reaches the surface of the tire through a process called “blooming”. Blooming is a process where protective wax works its way to the surface as the rubber tire flexes and compresses during use. When the tire is not in use the wax protection left at the surface from the previous use is consumed by oxidation, leaving the tire unprotected. When a tire is not in use the protective wax is not replenished because blooming only occurs when the tire is in use. Therefor tire degradation can vary depending on how often the tire is used. What do tires contain to help prevent dry rotting? In the earliest days of car manufacturing tires were not black, they were white, which is the natural color of rubber. Since white tires where highly vulnerable to UV damage and oxidation they were constantly needing to be replaced. To combat this problem manufactures began adding a filler called carbon black. Blending carbon black with the rubber compound used to produce a tire increased structural integrity making it less susceptible to rapid UV light damage. This ultimately resulted in a tire with a greater lifespan. In addition to carbon black, manufactures added a special wax and other protectants called antioxidents and antiozonants to provide even more protection against ozone, oxidation and UV damage. Although tire aging is unavoidable there are a few things you can do to extend the life of your tires. Avoid tire shine. Most tire shines contain petrochemicals and silicone that will dissolve the wax protectant, antioxidant and antiozone added by the tire manufacture leaving your tire with less protection from dry rot. Avoid excessively washing tires. Overly washing your tires with harsh cleaners might make your tire look nice in the short term, but what’s really happening is you are removing the protectants needed to preserve the tire. Drive vehicle frequently and never let your tires site unused. Regular use will ensure that wax protectant is constantly moving to surface of tire where it is needed to protect against ozone damage. Use an aftermarket product that will add additional protection from harmful elements. 303 Protectant is ideal because it does not contain harmful petro chemicals or silicone oils that strip away the tires manufacture added protectants. 303 Protectant will enhance protection from UV light and is long lasting because it absorbs into the tire. Your tires will also stay cleaner because of the water repellent and anti-dust protection provided by 303 Protectant. Best of all your tires are left with that new tire appearance rather than the unnatural glossy look left by most tire shine products.